Nina Pierpont tells me she’s interested in knowing if President Obama, a grave and intelligent man whom she voted for and even financially supported, would give some thought to installing a cluster of 1.5 MW turbines 1500 feet from his back door. Not such a preposterous idea, when you think about it. A sort of “do as I do” or “follow my example” or “nation’s leader” demonstration of his own good faith and support for that multi-billion dollar renewable energy program he just signed into law. Showing Americans–See, the President’s no NIMBY! Ballerinas in the sky, is what I calls ’em. With that real comforting, calming, soothing “refrigerator-like” humming 24/7. Ideal for nodding Sasha and Malia off to sleep at bedtime. Perfect for giving you and the missus sweet dreams and deep, deeply restful sleep. On further thought, it’s preposterous to imagine the nation’s First Family getting Wind Turbine Syndrome! Nope. What would the National Institutes of Health do if the President of the United States of America was awakened by “thump thump thump” or a howling “jet noise” every night at 2 am and couldn’t get back to sleep? Plus tinnitus. Ear pressure. Headaches. Nausea. Dizziness. Vertigo. Visual blurring. Tachycardia. Irritability. Panic attacks. Cognitive and memory impairment. Impossible! And the incoming Portuguese Water Dog peeing on those lovely carpets and howling all night. Impossible! “Change you can believe in.” Wind turbines in his own backyard. It’s worth suggesting, isnt’ it? I mean, the guy who dreamed up that line and parlayed it into the White House—maybe he’d go for it! This is the best photo and story that I have seen in ages. Wake up America! Let’s join forces and make officials do what they were elected to do. Protect the Constitution, the Bill of Rights, the citizens of the United States. I love the White House photo. 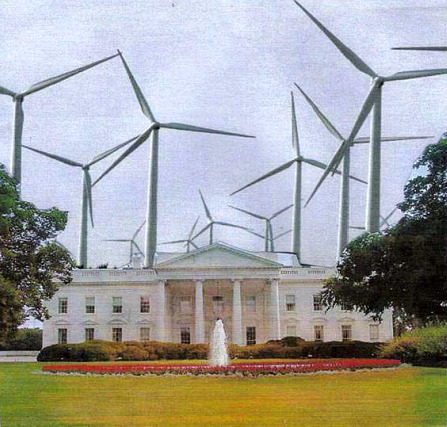 Obama should have wind turbines around his home in Chicago as well and where ever he lives. He does not care about people. He only cares about power. When will Americans wake up and see what he is doing to our wonderful country. He supports wind and solar, but doesn’t have a clue what it does to people, wildlife and the environment.